In a turn-of-the-century Renaissance Italian mansion, its tyrannical owner, a one-handed, wheelchair-bound pianist, with a strong belief in the occult, is murdered. Mob attorney Walter Colby is manipulated by showgirl Flaxy Martin into taking the rap for a murder committed by mobster Hap Richie's goons but he escapes and tries to get revenge. Dinky: What do you get out of bein' dead? Layin' in a grave ain't my idea of life. The face behind the mask, it's mutated, hideous, a horrible nightmare. Out of which I can never awake. 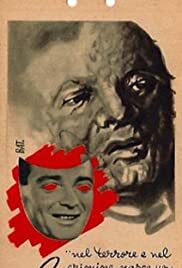 The Face Behind The Mask is directed by Robert Florey and collectively written by Paul Jarrico, Arthur Levinson and Allen Vincent. It stars Peter Lorre, Evelyn Keyes, Don Beddoe and George E. Stone. Music is by Sidney Cutner and cinematography by Franz Planer. The sands of time plays the death rattle. Lorre dismissed it as a bit of guff, but The Face Behind The Mask showcases one of his greatest performances. It's a film that beats a black heart, where fatalism is dripped over proceedings, the core of the narrative is the shattering of the American dream, and the makers here are not shy to put forward an uncaring society. After a breezy beginning the narrative becomes relentlessly bleak, right up to, and including, a no holds barred chilling finale that's preceded by a monstrous twist. Florey (also doing some of his best work) and Planer add stark imagery and scene setting that belies the B budget and quick turnover of the production (less than two weeks). A bleak harbour sequence is tonally adroit, the face mask surgery with faces adorning the walls is deliciously macabre, there's torture, too, and oblique backgrounds and shadow play. The dialogue may sometimes be too weak for the haunting story, but the film rises above it because of skills of the cast (Stone and Keyes excellent support for Lorre) and makers alike.